The Weatherbee Elementary School Advisory Council, along with district input, developed the following student uniform policy and standards. We believe there is a direct relationship between a student’s attire and classroom behavior, attitude, and achievement. Research has proven that students who follow a uniform dress code have fewer discipline problems, greater academic achievement, greater self-esteem, and school pride. Therefore, we are requiring students to wear clothing that is comfortable, clean, safe, and appropriate for an elementary school. This uniform dress code has been designed to promote safety and positive attitude. 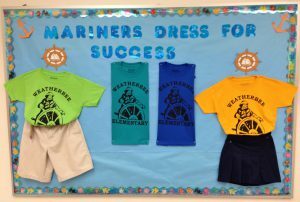 Weatherbee Elementary School has a mandatory school uniform program. Students are expected to wear their uniforms daily. When a student is not in uniform, the school staff will contact the parent to resolve the issue. The school uniform colors are navy blue, light blue, red, green and white. Uniforms may be purchased at local retail stores or uniform stores. A list of all local vendors will be available in the front office. •Note: Pants must fit properly at the waist. • Note: Pants must fit properly at the waist. Walking shorts must be at least finger tip in length and may not extend below the knee. Pants or shorts must be hemmed and may be cuffed or uncuffed. Jeans, denim, leggings, cargo pants, oversized, or sweat pants are not acceptable. Capri pants are acceptable for young ladies. • Note: All non-school logo shirts and blouses must have collars and sleeves and they must be tucked in. All shirts and blouses MUST be an appropriate fit. • Jeans and denim are not permitted. • Note: Skirts/Skorts must be finger tip in length or longer. • Style – Cardigan, v-neck or vest. • Note: A collared shirt/blouse as described above must be worn under the sweater or vest. • Note: School authorized sweatshirts may be worn. A collared shirt/blouse described above must be worn under the sweatshirt. • Sweatshirts with a hood or “hoodies” may not be worn per district guidelines. If worn to school, the student will be asked to remove the sweatshirt and will not be allowed to wear the hooded sweatshirt on our school campus. • Closed toe and heel. Heels must not exceed one inch. Shoes must be clean and in good condition. • Shoe laces must be laced and tied. • Shoes with wheels may not be worn. • Note: Jackets/coats with logos, words, lettering, prints or athletic team insignias are not acceptable. •Jackets must be removed during class. • Note: For safety reasons, no hoop earrings, please. • Excessive and/or large jewelry, including charms, is not permitted. • Any hair style, color or cut that is distracting or disruptive is not permitted. Example: Mohawks or Hair Designs (stars, lightning bolts, writing, etc.) Student displaying hair style, color, or cut that is distracting or disruptive to the school environment will be sent to the office. School administration will be the final judge. • Hats are not permitted to be worn in the building. • Scout uniforms may be worn on meeting days. • Students are expected to wear school uniforms daily. • Uniforms must be in clean and good condition. • In addition to the Weatherbee Uniform policy the District Dress Code requirements will be adhered to daily as adhered to daily as stated: The individual school administration/designees shall be the final judge of wearing apparel/accessories. They will determine whether or not such is appropriate, disruptive, offensive, distracting or in violation of health and safety rules. No clothing/accessories are permitted that promote drugs, tobacco, alcohol or violence. School spirit shirts may be worn on designated days in appropriate dress code policy. For a first offense, the student shall receive a verbal warning, and the principal shall call the student’s parent or guardian. For a second offense, the student is ineligible to participate in any extracurricular activity for a period of up to 5 days, and the principal shall meet with the student’s parent or guardian. For a third or subsequent offense, a student shall receive an in-school suspension for a period not to exceed 3 days, is ineligible to participate in any extracurricular activity for a period not to exceed 30 days, and the principal shall call the student’s parent or guardian and send a written letter regarding the student’s in-school suspension and ineligibility to participate in extracurricular activities to the parent or guardian. Families facing severe financial hardship may call the school office for assistance. Contact can be made by phone at (772) 468-5300 or in person. 1. When a student wears the uniform of a nationally recognized youth organization such as the Boy Scouts or the Girl Scouts on regular meeting days. 2. During special events or fund raisers approved in advance by the Principal.